Candidate promotes children’s vocabulary development. Read a few poems from any Shel Silverstein book aloud to your group. While reading the poems, use techniques to read engagingly. Hold the book so that children can view the illustrations, make eye contact, use voices for different characters and more. Invite children to create an illustration and corresponding poem in a silly fashion similar to the style of Shel Silverstein. Children should use pencils to make illustrations similar to those in the book. After the child finishes their illustration, a teacher should then transcribe their poem lines underneath the illustration encouraging the use of new vocabulary or synonyms for common words. Teach the new words as you go along. Hang all of the pictures on a bulletin board or wall with poems in a grid formation to resemble a large poetry quilt. 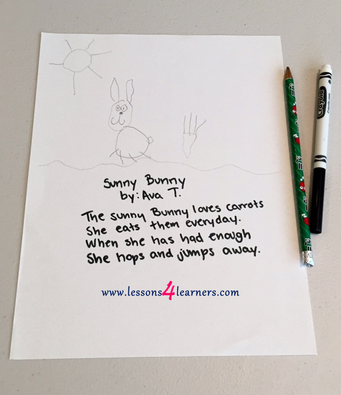 Observe and assess children in being able to connect their illustrations with a silly short poem similar to the nonsense poems of Shel Silverstein. Did they use rhyming words? Were they receptive to new vocabulary words?